Recently I was talking with a future client client (we don’t use the word “lead” around here…everyone is a future client) and there was some confusion about the difference between a website and a blog. When talking with clients and future clients alike this seems to create the most confusion. Is there a difference? by an individual with regular entries of commentary, descriptions of events, or other material such as graphics or video. Entries are commonly displayed in reverse-chronological order. “Blog” can also be used as a verb, meaning to maintain or add content to a blog. Website: A website (or “web site”) is a collection of related web pages, images, videos or other digital assets that are hosted on one web server, usually accessible via the Internet. Content Management System (CMS): A content management system (CMS) is a computer application used to create, edit, manage, search and publish various kinds of digital media and electronic text. The World Wide Web was “created” in 1990 by CERN engineer, Tim Berners-Lee. On 30 April 1993, CERN announced that the World Wide Web would be free to anyone. Websites were born. Until recently the typical website is, what I would call, an “online billboard” for a company. Websites were a place to go online to find information about a company and in some cases purchase goods or services directly from a checkout feature on the site. The primary focus was to be an online advertisement for the company. These “ads” gave a brief outline of the company’s products or services and listed contact info in hopes visitors would contact them. The term “weblog” was coined by Jorn Barger on 17 December 1997. The short form, “blog,” was coined by Peter Merholz, who jokingly broke the word weblog into the phrase we blog in the sidebar of his blog Peterme.com in April or May 1999. Blogs were born. The introduction of blogs produced a different type of website. These sites were typically created and used for purposes of an online journal by an individual. Authors of blogs are called bloggers and the range of topics that they blog about differ from one to another, but typcially bloggers write what they are passionate about. 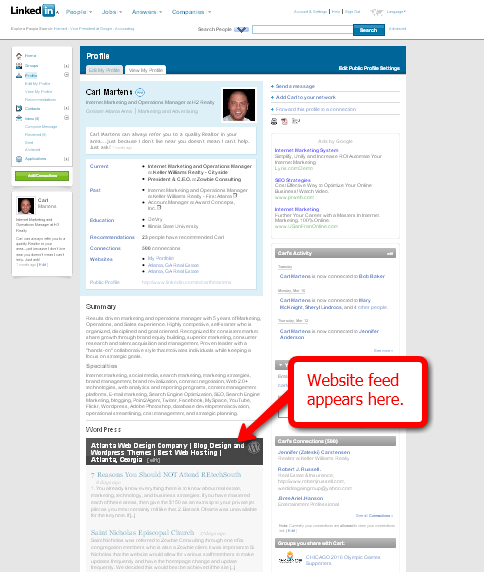 The term Web 2.0 was first used by Dale Dougherty and Craig Cline and shortly after became notable after the O’Reilly Media Web 2.0 conference in 2004. The term “Web 2.0” refers to a perceived second generation of web development and design, that aims to facilitate communication, secure information sharing, interoperability, and collaboration on the World Wide Web. Web 2.0 concepts have led to the development and evolution of web-based communities, hosted services, and applications; such as social-networking sites, video-sharing sites, wikis, blogs, and folksonomies. With the introduction of Web 2.0 somewhere along the way, web developers started to notice several benefits to designing websites using blog publishing applications; WordPress, Joomla, and Drupal to name a few. These benefits are primarily associated with the content management system that the blog publishing application is built on. Where most people get confused is that they think of a blog as an online journal. For this reason the term blog seems to have a negative connotation to most. All of the websites (unless otherwise specified) designed by Zowbie Consulting are built using WordPress as the CMS, thus the websites we design could be called blogs. For lack of a better term we will call the sites we design “blogsites”. The design of a blogsite can be setup in such a way that it can be an exact duplicate of an “online billboard” type site (traditional website), however with the site being built on a content management system the website would have a lot more functionality. 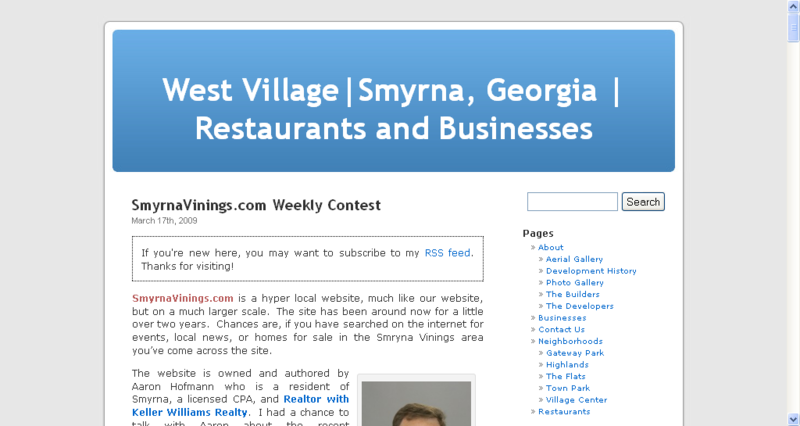 Pictured at right is the blogsite, EverythingWestVillage.com. All the content (WordPress pages and posts) remain the same as that of the screenshot above, however the site features custom coding and style sheets which enable it to appear more like a website than the look above which people tend to associate to blogs. The blogging component of a blogsite is used as a way to market to and generate future clients while the “website” is used more for the tools and application of working with current clients. A blog is just a marketing tool inside your website. A recap of what was learned. A blog is a type of website, however a website is not necessarily a blog. A blog uses a content management system (CMS), however not all websites use a CMS. If you would like to receive more information about blogsites, please contact us. Please post your comments or questions below. A real estate agent with Keller Williams Realty, Kelly Marsh, posted a question in her Facebook updates. Question is posted below. 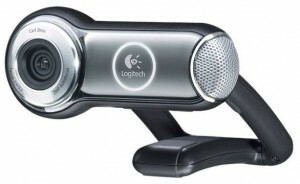 The question led to a great conversation of whether or not a Flip video camcorder or webcam was the way to go. Prior to the introduction of the Flip and other mini camcorders this question would have been relatively easy to answer. With the emergence of the Flip and others though a debate is in order. First, I’ll list what I see as advantages and disadvantages of both, then you post your opinion in the comments section below. 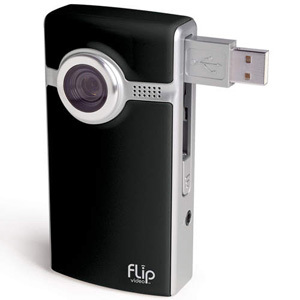 The Flip most certainly appears to have caught the attention of most consumes, but for those that desire more of a “built-in” solution the webcam still seems to be the preferred method. One last thing to mention, most Windows based laptops and just about all Apple computers (iSight camera) come with a built-in webcam…now that’s convenient! Awhile back I wrote a post about how LinkedIn is the most neglected of all social networks. Let’s face it, LinkedIn just isn’t as much fun as say, Facebook or Twitter. This tip will make it appear like you’re active on your LinkedIn account when really all you’ve done is setup your WordPress blog’s RSS feed to display on your profile. Connect your virtual lives with the WordPress LinkedIn Application. With the WordPress App, you can sync your WordPress blog posts with your LinkedIn profile, keeping everyone you know in the know. Once added, you can filter your posts with a special LinkedIn tag and even display your personal WordPress Gravatar (global avatar). Updates are automatically sent to your network for instant notifications and gratification. This should take you less than 5 minutes to complete, but it will most certainly leave a lasting impact on your business and its marketability. 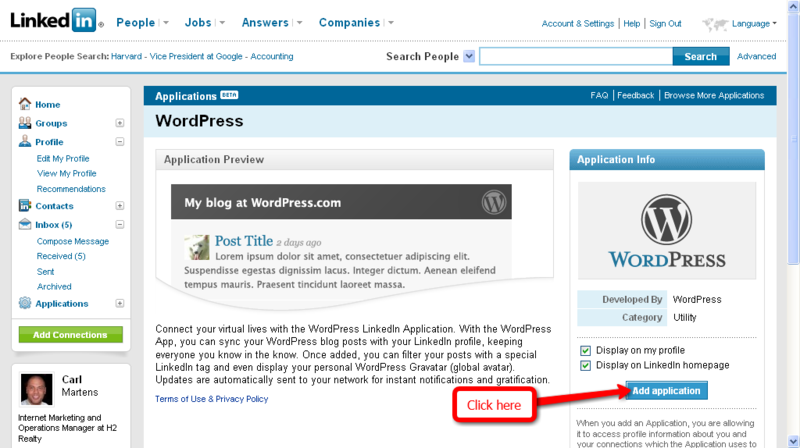 To start, you will need to install the WordPress LinkedIn Application. Click on the button that reads, “Add application”. Next, type in your blog’s URL. Example below. That’s it…you’re done! Now click on the “View My Profile” tab and you’ll see how the application has now integrated your WordPress blog feed into your LinkedIn profile. Zowbie Consulting, Copyright 2005 - 2010. All Rights Reserved.